Situated on a quiet, tree-lined street in the 15th arrondissement, the boutique Monsieur Chocolat has been receiving a lot of attention ever since Canadian pop singer Natasha St-Pier decided to wear their creation in the Chocolate Fashion Show. 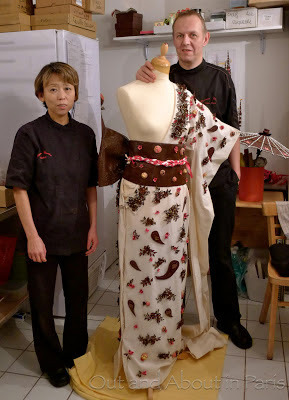 With only one more week to go before the opening night of the Salon du Chocolat, I was grateful that chocolatiers Jean-Marc Rué and Keiko Orihara took some time out from their busy schedule to give me a sneak peek at the magnificent kimono designed to celebrate Asia in the extravaganza, "The New World's of Chocolate". Trying rather unsuccessfully to ignore the irresistible aroma of cacao wafting through the air, I listened to Mr Rué describe the challenges of creating a dress made out of 60% chocolate as Mme Orihara used white chocolate to meticulously glue the delicate flowers to the sleeve of the kimono. According to Mr. Rué, the secret to making a dress that doesn't melt is to keep the chocolate well-insulated from the skin. He claims to have learned that lesson the hard way when his chocolate chef-d'œuvre started to dissolve during what he says was the worst night of his life in 2005. To keep the kimono intact while Natasha St-Pier waits backstage, Mr. Rue will have to continuously spritz it with a culinary cooling spray. When asked why they participate in the Chocolate Fashion Show, both Mme Orihara and Mr. Rué smiled with enthusiasm as he explained that they relish the challenge of working with a fashion designer to create a couture masterpiece. Ideally, the artists draw inspiration from one another as they discover ways to overcome the restrictions of each other's craft. As an example, Mr Rue told me that his biggest concern this year is that the chocolate will melt and indelibly stain the cream colored cloth selected by fashion designer Karyne Lauhon. When I replied that it hadn't even occurred to me how difficult it would be to work with white rather than brown fabric, he revealed that this sort of challenge arises when collaborating with artists from other domains. It's the synergy of couture and chocolate, however, that also allows them to produce something truly spectacular. On the day of the show, hairstylist Fabien Provost will arrange Natasha St-Pier's hair in an updo held in place with chocolate chopsticks. In addition to wearing the elegant kimono with an impressive butterfly bow at the back, the French Canadian singing star will carry a chocolate parasol and fan expertly crafted by Mr. Rué and Mme Orihara. 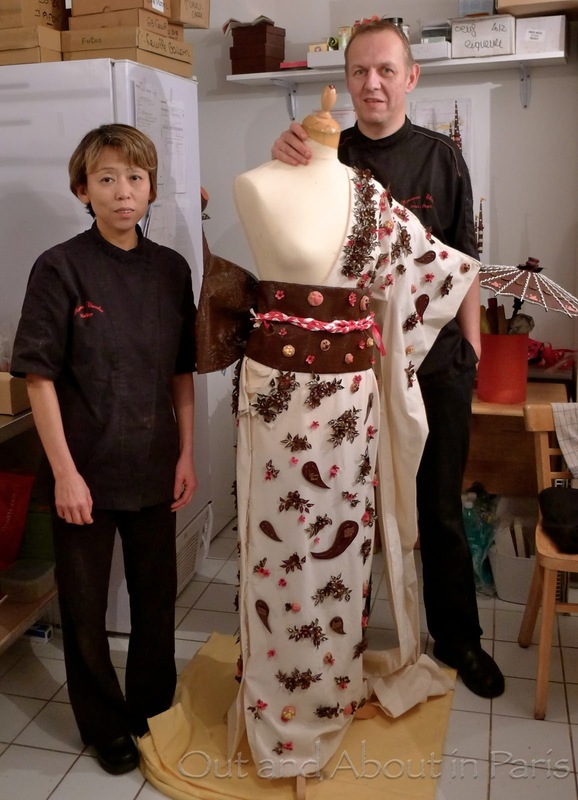 Thanks to the warm reception that I received by the two chocolatiers at Monsieur Chocolat, I'll be holding my breathe and hoping that their magnificent kimono stays intact during the opening night Chocolate Fashion Show on October 30. From October 31 to November 4, professional models will wear the chocolate dresses during the daily fashion shows at 5:00 pm. Please click here to see more photos of the kimono on "Out and About's" Facebook page. AMAZING. Just amazing. WOW! Look at that detail. I really want to see this worn...also, I kind of want to eat that sleeve. I'm such a white chocolate girl. I can't tell you how hard it was to resist popping a little flower in my mouth this afternoon. As you said, the details of the kimono are AMAZING. The longer I looked, the more I noticed. découvrez Natasha Saint-Pier en geisha parée d'un magnifique kimono chocolaté ! Milk chocolate>dark chocolate>white chocolate in my book! Wait, is the sleeve itself chocolate, or just the flowers? The sleeve is material decorated with chocolate flowers but maybe Mlle Ella wants to eat the sleeve because of the white chocolate that's used to "glue" the flowers in place! Personally, I felt like eating the fan or the umbrella! And, yes, I could have easily eaten the entire umbrella this afternoon. It smelled heavenly at Monsieur Chocolat. Very cool, MK! Can we call this "haut chocolat"? Your obsession with this event is so funny to me. I love it, but you're over the top excited about it. It's the chocolate more than the fashion, right? Or wait, you do like the exoticism of the fashion, I'm sure. So maybe all your allegiances are intrigued here--exotic fashion, chocolate, umbrellas, spectacles. Well, I can't wait to see your report from next week's show. A marriage between fashion and chocolate artistry, what a great combo! I would like a bite of the fan, since it's dark chocolate. Love your shot of the kimono top and sleeve! How fabulous. 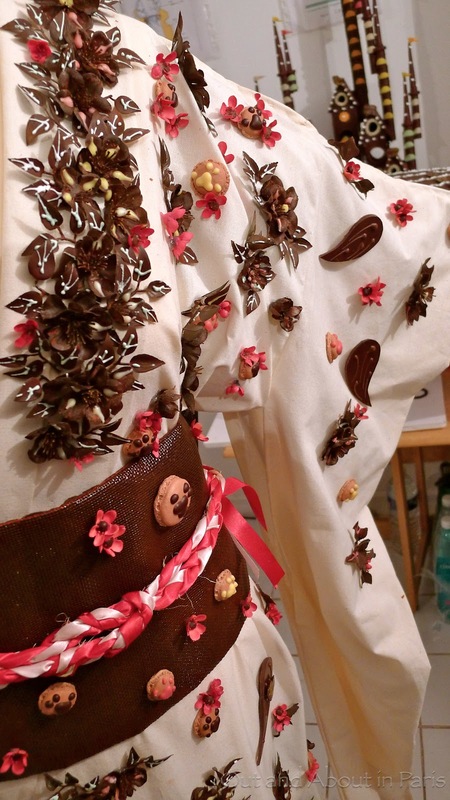 Clothes made of chocolate is a brilliant idea! Hey there! I've been following your web site for a long time now and finally got the courage to go ahead and give you a shout out from Huffman Texas! Just wanted to tell you keep up the fantastic work!